I'm thinking of trying some "old school" carbon steel blades. Any of you gents try any of these? If so which is best/sharpest? Carbon blades have a far sharper edge than stainless. I currently use Feather so if these are sharper me likey. I have always favored carbon steel cutlery, so I like the idea of carbon steel blades. The package you show on the left is the one for the so-called "Black Beauties." It is a good blade, but you have to use special care to keep it from rusting. Even then you will probably only get 2 - 3 shaves from it, and possibly only one. I don't know what the Classics are. They may be essentially the same blade. Not everyone likes Treet blades. The Dura Sharps are favorites of mine, as I find them sharp, smooth, and reasonably durable. I haven't used a Black Beauty in a very long time, so I don't remember much about it specifically. PS. Captain Caveman, these blades aren't as sharp as Feathers. 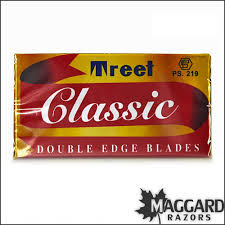 I have tried one variant of the Treet carbon blades and they were just awful, for me. You may enjoy them, so good luck. I tried the Treet carbon steel blades and some cheap Chinese Flying Eagle brand blades..... The Treets were terrible and the Flying Eagle.... well probably the worst blade I ever tried. I use vintage carbon blades all the time. If they are still sealed and in good condition they're always fine. vintage Gillette and Schick carbon blades= very good, current, in-production carbon blades(that I've tried)= very crappy. The Treet Platinum Supers are stainless blades with a platinum edge treatment and PTFE coating. I like these blades. The Trig blades are plain stainless, as I recall (no platinum, no PTFE). I haven't tried them, myself, but they have not been very well reviewed. 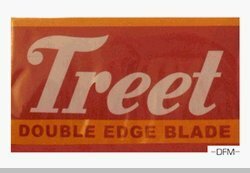 I'm disappointed that your sampler pack doesn't include Dura Sharps (PTFE-coated carbon steel), as they are the best and most popular blades Treet makes IMHO. Worst shaves I have ever had are from degraded vintage carbons. Hope for the best but prepare for the worst. The blades shown in the sample pack by the OP are all current or recent production. They are not old blades. If you use blades from a previously unopened sealed packages you should be fine with a vintage carbon blade. First shave with a good one can be awesome. With some. (04-09-2014, 10:36 AM)CMur12 Wrote: The Treet Platinum Supers are stainless blades with a platinum edge treatment and PTFE coating. I like these blades. the classics are the PTFE coated dura sharps. (04-09-2014, 06:12 PM)bharvey60 Wrote: Worst shaves I have ever had are from degraded vintage carbons. Hope for the best but prepare for the worst. They are all new blades still in production. I've been wondering what the Classics were since I first saw that packaging. Thanks for clearing that up. (04-10-2014, 10:05 AM)CMur12 Wrote: I've been wondering what the Classics were since I first saw that packaging. Thanks for clearing that up. I've used the Classics and for me they were a good blade. The problem is that, as others have written, they're carbon steel. For me they didn't stand a chance of making my "best of" blades list because of that. Lots of the old timers remember when SS blades first came out. It was like discovering the wheel; they were that good. For me no matter how good a CS blade is it's like going back to the bronze age after being in the space age. All that having been written, lots of folks like CS blades. You might also. Let us know. What I like about carbon steel for any kind of blade is that it can typically take a very keen, smooth edge much more readily than stainless can. I believe that is why stainless steel blades have platinum edge treatment and such, which just isn't necessary with carbon steel. PTFE/Teflon coating on the Dura Sharps also greatly enhances the blade's smoothness and longevity. I will point out, however, that I disassemble my razor and blade after every shave, I rinse and air-dry the blade, then I hand-strop the blade. I believe that drying the blade quickly after use is important. Hand-stropping may also remove some impurities that would otherwise promote rusting. Beyond that, I live in a dry climate. This all being the case, I have never had a Dura Sharp rust on me and they last me almost as long as the better stainless blades. Of course, YMMV, and Brian's cleary varies from mine. I love carbon blades.The old Gillette "blue" blades were the sharpest and smoothest blades I ever used.You can make a carbon blade much thinner than SS. Sure,you have to "blot" them dry with toilette tissue,no big deal,I never had a problem with rust or oxidation before I got in a good 4-5 shaves.This morning I used the Treet carbon dura-sharp,a fine blade,and using the blot technique,I will see how many shaves I get out of it.The price is right on these as well,I just scored 200 for $19 shipped from Ireland.